This post contains referral/affiliate links, which means I may receive a small commission, at no cost to you, if you make a purchase through a link. Please refer to my affiliate disclosure policy. Deleting pins on Pinterest takes time. Chasing down those saves and repins is a pure nightmare. Like when you get a side cramp while running that marathon. What if you invested the time it takes to delete pins and boards into creating new content? Content that your ideal client would be so in love with and would organically save on Pinterest. That would in turn make you more money and your ROI would be huge. Here’s the thing. If you have time to waste on hunting and deleting pins on Pinterest, I’m going to wonder when you actually work on your business. Anytime someone asks if they should hunt down pins to delete them, I tell them it’s not worth my time or my sanity. I also tell them to bury those pins with new content. Keep moving forward. In the marathon you don’t keep looking back. You run forward towards the finish line. Seriously, deleting pins on Pinterest because they are “underperforming” makes no sense. Statements of traffic soaring are still all over the internet from the bloggers who pushed this trick. And, sure, it makes great sense in THAT moment. But the thing with Pinterest is that it is the slowest platform to catch on to something. It does not (usually) give instant gratification. Just like training for the marathon, there is no magic pill or button that is going to make you run faster. What if deleting pins on Pinterest resulted in you deleting a pin that was going to go viral next month? Or a year from now? Or what about 5 years? You just never know when something is going to take off on the platform. If those underperforming pins no longer exist, they can’t go viral. They never even got the chance. When you show up to the marathon without a race bib, the staff don’t let you run. Without the bib, you’re like a deleted pin. Discarded and sad. But what about deleting Pinterest boards? As I have mentioned in previous posts, like the 7 Things You Need To Know About Pinterest Boards, I don’t do it. Did you know that when you delete a board on Pinterest it deletes followers? Yep. Let’s say you have one very popular board and Pinterest users only followed that board and not your entire account. And then you go on a board deleting spree. That board is gone and so are the followers. I made this mistake early on and lost about 700 followers for one of my beta clients. It happens. They were a beta client, but I still feel horrible about it to this day. But, that’s how you learn. By sharing my misfortune, I hope you don’t make the same costly mistake. Archive or Make Boards Secret! Guess what? It takes just as long to delete a board as it does to make it secret or archive it. Which is why I recommend making boards secret or archived instead of deleting them. Not sure what a secret board or an archived board is? Get the scoop on my post here: The Four Types of Pinterest Boards. You don’t lose the followers in your count, but no one sees that board anymore. I don’t know the science behind how that works, but you need to trust me. Why do followers matter on Pinterest? They count towards your overall influence and that’s important if you ever want brand collaborations or sponsors. Why does your rank in the marathon matter? If you’re a sponsored runner it means money, but if you’re just wanting to check off your bucket list it makes you feel accomplished! If the answer is no, don’t do it. One person tries something and suddenly it’s the gospel. Do you get caught up in this? If so, I want to encourage you to join my facebook community so you can ask questions and see the information I share including Pinterest best practices. Just like bro-science with marathon training, if it doesn’t help your long-term game then forget it. Is Your Pinterest “Tricks” Source Reliable? Know your source. If they aren’t a trusted Pinterest expert, then keep moving forward and ignore it. However, if it is a trusted Pinterest expert, take head in what they are saying and make SLOW adjustments as you implement any changes in your strategy. Sometimes friends and other bloggers mean well, but they don’t have the right information. And it is SO easy to misinterpret information. Another thing to note: when was this person’s content written? If the content is super old (say 18 months or more), it probably isn’t relevant anyway. Make sure you are staying in the know if you are managing your own Pinterest account. This is a perk of hiring a Pinterest Strategist to manage your account: they keep up with the constant changes on the platform. 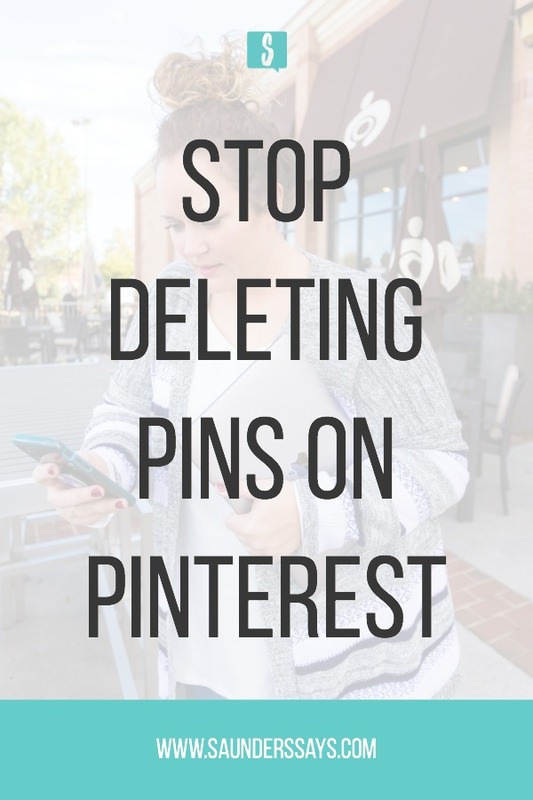 Deleting pins on Pinterest or even boards takes more time than you should dedicate to it. It does not help with the long-term game that Pinterest is known for and could result in irreparable damages. There will always be tricks and myths around Pinterest. I don’t share tricks. What I do share is best practices and tips from Pinterest and I stay up-to-date with my knowledge regarding the platform. Tricks are for April Fool’s Day, not Pinterest. Again, if it sounds like a trick or a gimmick, it probably is and you can always ask in my facebook community. Now, let’s go crush that marathon, yall!